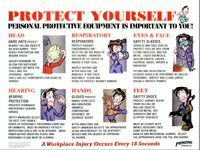 Title: 07/02/1986 - Requirements for fingerprint powders containing carbon black under the Hazard Communication Standard. Your letters dated April 22 and May 5 have been forwarded to our office for response. Mr. Anderson, Assistant Regional Administrator in Region IV, has informed us of your concern regarding the health hazards of your fingerprint powders containing carbon black. The Occupational Safety and Health Administration's (OSHA) Hazard Communication Standard (HCS) requires chemical manufacturers and importers to evaluate chemicals produced in their workplace or imported by them to determine if they are hazardous. Any chemical for which OSHA has a permissible exposure limit (PEL) or the American Conference of Governmental Industrial Hygienist (ACGIH) has a threshold limit value (TLV) is automatically considered hazardous as part of the standards floor of chemicals. Those substances regulated as carcinogens under 29 CFR Part 1910, Subpart Z, Toxic and Hazardous Substance, Occupational Safety and Health Administration. In addition, for health hazards, evidence which is statistically significant and which is based on at least one positive study conducted in accordance with established scientific principles is sufficient for a notation to appear on the material safety data sheet. Carbon black does have an OSHA PEL and is also listed by ACGIH. It is therefore automatically considered a "hazardous chemical" under the HCS and any associated health and/or physical hazard would have to be reported on the material safety data sheet. According to IARC the available data on carbon blacks are inadequate to permit an evaluation of their carcinogenicity to experimental animals. However, there is sufficient evidence that solvent (benzene) extracts in most of the carbon blacks tested are carcinogenic to experimental animals. A chemical manufacturer or importer would have to indicate the results of such studies on the material safety data sheet. A cancer warning on the product's label would not be required since the available epidemiological data provides inadequate evidence to evaluate the carcinogenicity to humans of carbon blacks. If you have any further question please contact the Office of Health Compliance at (202) 523-8036. We have received the enclosed letters and package of information from James W. Gocke of Sirchie Fingerprint Laboratories. Mr. Gocke has requested an official OSHA interpretation of the health hazards of fingerprint powder containing carbon black (specifically whether or not carbon black is considered to be a suspect carcinogen). Information is the IARC Monograph, Volume 3, page 23, indicates that: "The reported inability to induce cancer in mice by feeding carbon black... or by applying it to the skin... was overcome by administering solvent extracts by injection or by skin painting." The monograph indicates that carbon black of the furnace - black type contains several polycyclic aromatic hydrocarbons (PAH). IARC Volume 33, page 77, indicates that, "The available epidemiological studies on workers in the carbon-black industry are largely uninformative". Regarding an evaluation of experimental animal carcinogenicity, the data on carbon blacks are inadequate. Volume 33 does state, however, that there is sufficient evidence that solvent (benzene) extracts of most of the carbon blacks tested are carcinogenic to experimental animals. Exhibit G in the attachments, a study done by the Carbon Black Industry Committee for Environmental Health, presents evidence that the carbon black itself is not carcinogenic, and that the PAH's absorbed to carbon black are not biologically active. Please also note that Exhibit I in the attachments is a letter from Thorne Auchter dated July, 1983, which states that the designation of "suspect carcinogen" for carbon black was removed from the 1983 draft of the IHFOM (currently the Technical Manual). We have informed Mr. Gocke that we have forwarded his letters to your office. We would appreciate your responding to Mr. Gocke directly and sending us a copy of your reply. If you have any questions, contact Charlie Anderson, ARA for Technical Support (FTS 257-2281). 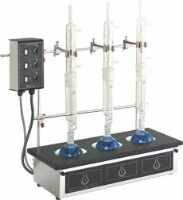 Get your organic laboratory equipment and glassware from Safety Emporium.